There was a whole lot of reading going on at Willard Elementary School on Tuesday morning, even more than usual as the school hosted an event that was equal parts please and thank you. Read to Succeed is a United Way program that formally launched in the spring of 2016 during a ceremony on the front lawn of Greenwood Elementary School. This was just as pretty a day, another one perfectly suited for an outdoor media event. Maybe even a prettier one since the occasion this time was to share lots of good news that’s happened thanks to RTS. Tuesday was United Way of Central Iowa’s annual Day of Action. To prove the point, plenty of volunteers were on hand to spend an hour inside reading with Willard 3rd graders prior to the ceremonies outside, employees from community partners Sammons Financial Group, Farm Bureau and KPMG. Lesa, one of the Sammons volunteers, connected with a couple of live wires, Ayden and Bryan. Together they read, and enjoyed, When Walt Disney Rode a Pig. With sunlight streaming in the window just above them, the boys took turns reading pages aloud. Ayden sprawled on the polished hallway floor and Bryan sat with his legs crossed. Lesa peppered them with questions. All three giggled and drew parallels between the lively account of Disney’s boyhood dreams and their own personal experiences. This was the simple magic everyone would soon be talking about outside. 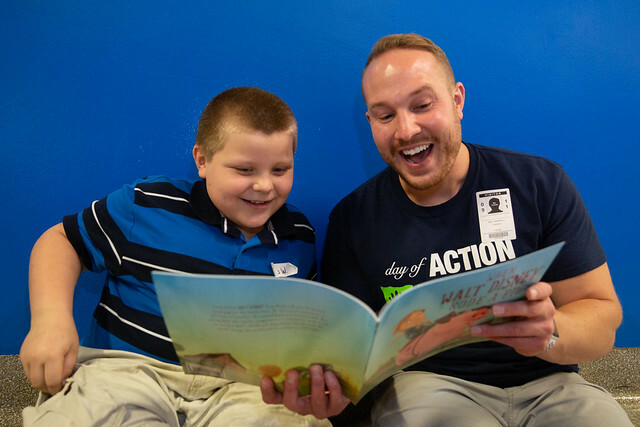 500 new volunteers have signed up to read with an elementary school student through Power Read, in partnership with Everybody Wins! Iowa. Of the 896 students who read with a Power Read volunteer last year, 99.6 percent improved their reading skills. Vision To Learn was launched in Des Moines in May 2017, and last school year, provided more than 700 students at 22 elementary schools with eyeglasses. The program is expanding this school year to two middle schools in addition to 22 elementary schools in central Iowa; all schools served by the program have more than half of students on free and reduced-price lunnch. Nationally, the program has found that 90 percent of low-income students who need eyeglasses do not have them. Central Iowa businesses donated 40,000 books, 10,000 more than projected, through Stuff the Bus, which were distributed to child care centers, in-home providers, and partners. Research shows that most low-income students do not have access to age-appropriate reading materials. There’s still a ways to go. Currently, one quarter of central Iowa 3rd graders are reading below grade level. Want to help close the gap? Visit www.read2succeed.org to find out how. It’s easier than riding a pig – and maybe even more fun.